Once in Tel Aviv, one of the most amazing views you’ll experience near the ocean is that of Jaffa located on a natural harbor on a hill along the shore of the Mediterranean Sea, only a short distance from the popular beaches of Tel Aviv. 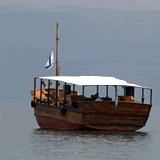 This ancient port is a regular stop for Israel holy land tours. It’s the oldest municipality in Israel, and famous for being in the Scripture stories of the bible of Solomon, Jonah, and the disciple Peter. Jaffa was strategically situated at the center of ancient Israel, with a coastal roadway that linked the northern region of Israel with Mesopotamia, Syria, Asia, and south to Egypt and beyond. Today’s Christian Holy Land tour itineraries will include touring Jaffa with a guide or will allow leisure time to explore Jaffa on your own where you can explore the ancient passage ways of Old Jaffa, see St Peter’s Church and enjoy stunning views of the shoreline from the Jaffa hilltop. One of the most captivating biblical stories that took place in Jaffa is the mention of the cedars of Lebanon for the construction of Solomon’s Temple (2 Chronicles 2:15). It was the Jaffa port where the cedars were shipped into Israel. "And Solomon determined to build an house for the name of the Lord, and an house for his kingdom, and Solomon sent to Huram the king of Tyre, saying, send me also cedar trees, fir trees, and algum trees, out of Lebanon, and we will cut wood out of Lebanon, as much as thou shalt need: and we will bring it to thee in floats by sea to Joppa; and thou shalt carry it up to Jerusalem." Other Scriptures about Jaffa found in the bible include the one about the cities that were offered to the Hebrew Tribe of Dan (Book of Joshua 19:46 ), the location where the prophet Jonah embarked on his sailing trip to Tarshish (Jonah 1 3), and this is when a violent storm threatened the sinking of the ship, and the mariners threw Johan overboard, and was swallowed by a whale, "and Jonah was in the belly of the fish three days and three nights." Finally, Johan did what was commanded to him by the Lord, and was “vomited out upon dry land,” and continued to Ninveh to complete the mission. In the New Testament Jaffa is mentioned as the place where St Peter’s resurrection of the widow Tabitha (Dorcas, Gr.) takes place (Acts 9:36). The Scriptures relates the presence of Peter in Jaffa (Acts 10:10–23), with his vision of a large sheet filled with "clean" & "unclean" animals being lowered from heaven, together with a message from the Holy Spirit to accompany messengers to Cornelius in Caesarea. With so much to see and ancient history to be part of in Old Jaffa such as the house of Simon the tanner, we highly recommend your Israel tours include a visit to this holy land destination. Recently there have been many renovation’s to Jaffa, becoming a viable tour destination where tourist and locals alike can walk in the narrow alleys, visit artist galleries, museums and shops where you’ll find the perfect souvenir to bring back home.